Resides in Mao Valverde, DR during the offseason...Attended Keeping Kids in the Game; participated in the pregame ceremony prior to the annual ¡Fiesta Tigres! game, the Tigers Winter Caravan and TigerFest. Split the 2018 season between Triple A Toledo and Detroit, appearing in 63 games for the Mud Hens and 62 games with the Tigers...Selected to the International League Midseason All-Star Team...Belted a pair of homers on April 28 vs. Louisville…also hit two homers on May 13 at Louisville and May 30 at Syracuse...Hit for the cycle on May 30 at Syracuse, going 5x6 with a double, a triple, two home runs, five RBI and 14 total bases...Earned Tigers Minor League and International League Player of the Month honors for May after hitting .383/.407/.652 with 19 runs scored, nine doubles, two triples, six home runs and 24 RBI...Made his Major League debut on May 31 vs. Los Angeles (AL), going 2x4 with a run scored…became the first Tiger to have multiple hits in his Major League debut since JaCoby Jones on August 30, 2016 vs. Chicago (AL)...Hit the first home run of his Major League career on August 23 vs. Chicago (AL)...Played in 26 games with Aguilas Cibaenas of the Dominican Winter League, hitting .231/.248/.279 with six runs scored, three doubles, one triple and 11 RBI. Spent the entire 2017 season with Triple A Columbus, playing in 117 games...Named an International League Postseason All-Star and an Organization All-Star by MiLB.com... Ranked tied for fifth in the International League with a .291 (130x447) batting average...Sidelined from June 1-16 with a right abdomen strain...Collected a season-high four hits on July 14 at Toledo...Posted a .333 (32x96) batting average with 15 runs scored, six doubles, one triple, seven home runs and 21 RBI in 26 games during July. April 14, 2019 Detroit Tigers recalled 2B Ronny Rodriguez from Toledo Mud Hens. March 23, 2019 Detroit Tigers optioned 2B Ronny Rodriguez to Toledo Mud Hens. January 12, 2019 Toros del Este placed 2B Ronny Rodriguez on the reserve list. December 19, 2018 2B Ronny Rodriguez assigned to Toros del Este. July 5, 2018 Detroit Tigers recalled Ronny Rodriguez from Toledo Mud Hens. June 23, 2018 Detroit Tigers optioned 3B Ronny Rodriguez to Toledo Mud Hens. June 13, 2018 Detroit Tigers recalled Ronny Rodriguez from Toledo Mud Hens. June 7, 2018 Detroit Tigers optioned 3B Ronny Rodriguez to Toledo Mud Hens. May 31, 2018 Detroit Tigers selected the contract of Ronny Rodriguez from Toledo Mud Hens. 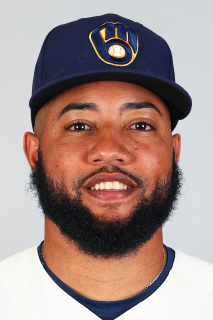 February 1, 2018 2B Ronny Rodriguez assigned to Dominican Republic. January 30, 2018 3B Ronny Rodriguez assigned to Toledo Mud Hens. December 21, 2017 Detroit Tigers signed free agent 2B Ronny Rodriguez to a minor league contract and invited him to spring training. November 6, 2017 2B Ronny Rodriguez elected free agency. June 17, 2017 Columbus Clippers activated 2B Ronny Rodriguez from the 7-day disabled list. June 13, 2017 Columbus Clippers placed 2B Ronny Rodriguez on the 7-day disabled list. January 30, 2017 2B Ronny Rodriguez assigned to Dominican Republic. January 20, 2017 Cleveland Indians invited non-roster 2B Ronny Rodriguez to spring training. September 7, 2016 2B Ronny Rodriguez assigned to Columbus Clippers from AZL Indians. September 3, 2016 2B Ronny Rodriguez assigned to AZL Indians from Columbus Clippers. March 4, 2016 3B Ronny Rodriguez assigned to Cleveland Indians. November 14, 2015 Estrellas de Oriente traded Juan Diaz and 2B Ronny Rodriguez to Aguilas Cibaenas. September 15, 2015 2B Ronny Rodriguez assigned to Columbus Clippers from Akron RubberDucks. July 21, 2015 Akron RubberDucks activated 3B Ronny Rodriguez from the temporarily inactive list. July 8, 2015 Akron RubberDucks placed 3B Ronny Rodriguez on the temporarily inactive list. March 13, 2015 IF Ronny Rodriguez assigned to Cleveland Indians. April 21, 2014 Akron RubberDucks activated 3B Ronny Rodriguez from the temporarily inactive list. April 16, 2014 Akron RubberDucks placed SS Ronny Rodriguez on the temporarily inactive list. March 9, 2014 SS Ronny Rodriguez assigned to Cleveland Indians. February 24, 2013 IF Ronny Rodriguez assigned to Cleveland Indians. December 9, 2012 SS Ronny Rodriguez assigned to Estrellas de Oriente. September 5, 2012 SS Ronny Rodriguez assigned to Akron Aeros from Carolina Mudcats. October 12, 2011 SS Ronny Rodriguez assigned to Estrellas de Oriente. September 6, 2011 SS Ronny Rodriguez assigned to Kinston Indians from Lake County Captains. May 13, 2011 Ronny Rodriguez assigned to Lake County Captains from DSL Indians. March 7, 2011 Ronny Rodriguez assigned to DSL Indians. October 5, 2010 Cleveland Indians signed free agent SS Ronny Rodriguez to a minor league contract.